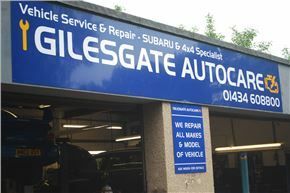 Gilesgate Autocare is ranked #1 in Northumberland and specialise in Subaru and Four Wheel Drives although they service, MOT and repair any make and model too. This garage is located in Hexham and their experienced specialised technicicans will work on your car at a fraction of main-dealer costs and keep your Subaru warranty protected. All work is carried out to the highest possible standards. If you're looking for a bespoke stainless steel exhaust look no further! "1st class - absolutely everything"
Took my Subaru Outback in for extensive work - head gaskets, full service, all fluids, wheel bearings, suspension parts, brake calipers etc etc etc basically a "fix everything that needs fixing" visit, Chris was totally transparent in what needed done and put it all in writing in an email with individual costs and options etc. It was of course a sizable bill (due to the work carried out, totally my choice) but i feel that i got value for money, my car now drives as new, these guys are better in every way than main dealers, My previous car was a Lexus and Gilesgate put Lexus dealer to shame with their customer service (not an easy thing to do) and of course their pricing. Spot On. Most Highly recommended. "I know things will get fixed at a the best price"
Some much needed brake repairs to my Forester were completed really quickly and efficiently. There was a lot needed fixing, so it was never going to be cheap, but I feel I was charged the best price possible under the circumstances. A few days later I was driving the car across the Bealach na Ba pass to Applecross fully confident that the brakes were professionally serviced. I've never been disappointed by this garage. Problems with my Toyota Yaris were diagnosed and repaired very much to my satisfaction. I never get the feeling here that I get at other garages of being 'fobbed off'. The owner always takes time to explain what work is needed. All in all I'm very happy with the service here. "Top quality work at a fair price"
This garage both services and repairs my Mercedes and my wife's Honda - and a great job they do too. Why on earth would we take our cars to a main dealer and pay almost double? Its a no brainer. Best of luck to the people at Gilesgate. "Great garage that is honest, friendly and reliable"
"Ex Subaru staff now giving even better value for money servicing "
I have had a number of cars looked after and fixed by these guys over the years. I can honestly say that they have never let me down. There have been occasions where we've had "last minute traumas" before holidays, and Chris would always say "bring it straight in, we'll see what we can do". These days, in many garages/dealerships "customer service" seems to translate to leather sofas, televisions, glossy magazines and coffee machines - regardless of what happens to the car. At Gilesgate Autocare, they simply do their best to service or fix my car, and keep me informed of whats happening. I wouldn't take my car anywhere else. "So lucky to have these guys on my doorstep." I can only echo the sentiments of the previous review. Excellent service and advice on the many occasions we've used this garage. They're fully trained Subaru specialists so are an obvious choice for our Forester. However over the years they've provided great service to our other various cars as diverse as an Alfa Spider, Mazda MX5 and a Toyota Corrolla, so don't assume their skills are restricted to Subaru. I really can't praise them highly enough. Top guys and very highly recommended.